Food Blogga: What is Tat Soi? I first tasted tat soi about three years ago at the Santa Monica farmers' market. I was intrigued by its name and uniquely attractive appearance -- little bouquets of lush, dark green, spoon shaped leaves. When I asked the farmer what it tasted like, he pinched off a leaf, handed it to me, and said, "It's pretty strong. But here, try it for yourself." I took a small bite of the firm yet soft leaves and was struck by its sharp, spicy flavor that tickled my nose and tingled my palate. I said, "I'll take two bunches." I have been an ardent fan ever since. Tat soi is a well loved Asian green that goes by many names including flat cabbage, rosette bok choy, and spoon cabbage. It's a member of the brassica family which includes broccoli, Brussels sprouts, collards, and kale. What does tat soi taste like? Tat soi tastes like a milder version of mustard greens and has a texture similar to bok choy. It's low in calories yet high in minerals, vitamins, and health-promoting antioxidants. How do you cook with tat soi? Tat soi is most often eaten raw in salads. It's delicious in soups, or cooked (sauteed, boiled, or steamed) and served as an accompaniment to seafood, chicken, or tofu. Where can you buy tat soi? Though tat soi is widely available at many California farmers' markets, you don't have to live in the Golden State to enjoy it. It's available at Asian markets; with its rising popularity over the last few years, many organic and specialty markets have begun carrying it as well. This simple recipe features sauteed tat soi that is bathed in a tangy, spicy ginger sauce and paired with tofu, though grilled white fish or sauteed shrimp work well too. It's delicious served atop jasmine rice. 6 ounces extra firm tofu, cut into "steaks"
In a small bowl whisk all ingredients from soy sauce through cayenne pepper. In a large skillet over medium high heat, add 2 teaspoons sesame oil. Add tofu steaks; cook for 5-7 minutes per side, or until golden brown. Remove from skillet. Add remaining 1 teaspoon sesame oil to skillet; add tat soi; once wilted, add sauce. Reduce heat to medium-low, and cook just until sauce slightly thickens. Divide greens on plates. 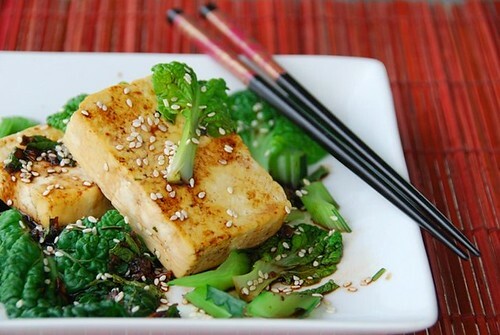 Top with half of the tofu. Drizzle with remaining sauce, and sprinkle with sesame seeds. Serve immediately. I love tat soi! This looks divine! This looks delicious, I never tried soi, but I bet I 'd love it. This is wonderful! Green, healthy, and I everything but the tat soi at the ready in my pantry. This would be perfect for one of my nights when I'm cooking for just myself. Easy and flavorful. I learn something new each time I visit your space. What a great use for tat soi. I can't wait to go to my local farmer's market to get my hands on some. And it seems to have paired so nicely with these tofu steaks! Thanks for teaching me about tat soi! It's beautiful! And the recipe sounds like something we'd love. Thanks. Never heard of this Susan, but it certainly looks delicious. I will have to keep a look out for this. We have a very large Asian grocery store here so they will probably have it. This sound great to me! I'd love to try growing this if I could ever manage to get my garden started early enough! Love the recipe, btw. I make something similar with spring greens but I shall definitely try out your version soon. I love tat soi and I grew some in my little garden last year. Warning: snails and slugs love it too. I am actually headed to the asian grocery store this afternoon to pick up some noodles for my husband. I'm going to give a looksie to see if they carry this. I may have seen this at my local farmers market but had no clue what it was. I'll have to specifically look for it next time I go. So many beautiful greens to try...this is one I don't think I've seen. Anyway I get scared away by the asian greens sometimes! Looks delicious though. I've got to try this. I LOVE all greens. Thanks for the introduction to a new leafy green! I have tat soi growing in my garden and mainly use it in salads, but this dish looks fabulous! I'll have to try this diversion. I never had this kind of green..and thank you so much for sharing such nice information about it. Great combination with tofu. Nice pictures. By the way, thank you for visiting my site. 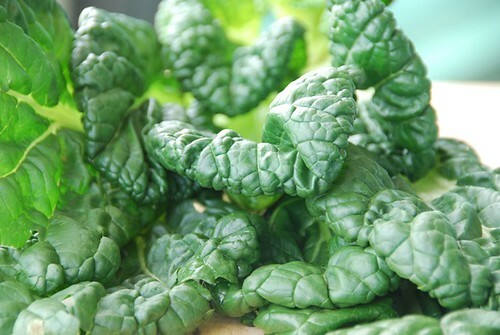 Tatsoi has been showing up at some farmers' markets here in RI in the past couple of years. I'll be looking for it when the markets open again next month. There are just so many good green leafy vegetables out there. Thanks for sharing your knowledge on this one. And might I add what a delicious recipe too! I hope you wouldn't mind having Foodista readers directed to your blog. Just add your choice of widget and you're all set! Nope, not come across that one before. But a cross between bok choy and mustard greens sounds good to me, for sure! Your "steaks" look delicious. I suspect that what I was told was tat soi last summer was actually not - it looked nothing like this. There can be some confusion on these wonderful varieties of greens. foodlibrarian-I'm so happy to hear that! haleysuzanne-It's all good, isn't it? elyse-You're quite welcome! Good luck at the market. debbie-I'm sure they will. Good luck! kalyn-It would be a lovely addition, indeed. karina-It is in the same family. Let me know when you'll be here! simona-Thanks for the heads up! ashley-I hope you find some! everydayfoodie-No problem. I love it, but my husband doesn't, so I understand. mrsl-Glad to be of help. julia-In your own garden? You're lucky! lydia-I'm glad to hear that. desmone-I'm glad you like the recipe. tw-Indeed. They are so many varieties nowadays. This recipe sounds really good, Susan. I love tatsoi. Can't wait for the first garden crop of it! Paired with those tofu "steaks," you've got a perfect combination. gorgeous pics. i will look out for this. Thanks for introducing me to an interesting ingredient. It sounds rather good and I hope to run across it here on the east coast. This is an interesting ingredient. I will have to try out your recipe. And hopefully if it tastes as delicious as it looks, I might try using it in some of my own recipes. Thanks for the intro! Im in the COLD Waikato and my Tatsoi has been growing from early August and is prolific! Brought mine from the most unusual of places - Matamata Supermarket for anyone out there! Natasha. This was really good. We received 2 bunches of Tat Soi from our community garden and Googled Tat Soi and found this page. The sauce is great and would work for many types of greens. anonymous-I'm so happy to hear it! Community gardens are so wonderful. Does anyone know if tat soi can be blanched & frozen? I work with a small group that gets surplus farm products. We got a huge batch of tatsoi & have distributed most of it to our food challenged families. We have more left than can be used before it goes bad. We're thinking it can be frozen for use in oriental soups. Wow. We got some tatsoi in our veggie basket and I came upon this recipe tonight and just happened to have all the ingredients. Super impressed - it was absolutely delicious! Will be looking for more tatsoi so I can make this again. amyj-Woo-hoo! Another tat-soi lover! Isn't it lovely? I've been looking for this for a long time. Used to be included in a favorite Trader Joe's mix, but then they dropped it. Mad, sad--but now that I know what it is, I can find and grow my own, somehow! You can buy seeds for Tat Soi & many other wonderful organic foods at Puritan's Pride (vitamins.com). I have not tried it yet, but am looking forward to it. I am not affiliated with PP, but have most satisfactorily shopped there for many years. anonymous-Great point. Thanks for sharing!